Most people worry about irrigation when they put in a new landscaping project, yet overlook another important aspect of keeping plants healthy – drainage. In fact, drainage is one of the most overlooked concerns in Charlotte area landscaping projects, yet it can lead to declining, unhealthy plants and withered lawn. If you are noticing poor plant or lawn health or pooling water in your yard, it’s time to talk to the team at Vision Green Landscape about lawn drainage services. Your lawn and your plants need water to survive, but too much water is detrimental to their health. If you have areas of your yard where water regularly pools, either due to high water tables, poor soil permeability or a lack of a grade in your yard, your valuable landscaping could be damaged. In addition, poor drainage near the foundation walls can damage your home, leading to water in your basement or crawlspace. How much water is too much? If you notice water sitting for more than a half an hour somewhere in your yard, then you have a problem that needs to be addressed. The solution to these problems is the addition of natural drainage to your yard. By adding drains to the yard and changing the landscaping, the landscaping professionals at Vision Green Landscape can funnel water away from your plants, lawn and home. We can also install gutters and downspouts to further help with drainage problems, emptying water from your roof away from your yard and into dry wells or subsurface drains. The team at Vision Green Landscape will assess your water flow situation and create a custom solution to help channel the water where it needs to be. 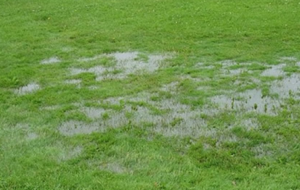 Don’t let standing water ruin the hard work you have put into your yard, lawn and landscaping. Call Vision Green Landscape today for lawn drainage services.